I first heard of Warm Bodies author Isaac Marion about year ago. Someone somewhere recommended his blog to me, saying he has a good little zombie story written on it. I read it and thought it was interesting. Now a year later, I came across his name again, this time in a magazine. There was an article in Entertainment Weekly showcasing which young adult novels studios have optioned and are adapting into films. Warm Bodies was one of them. 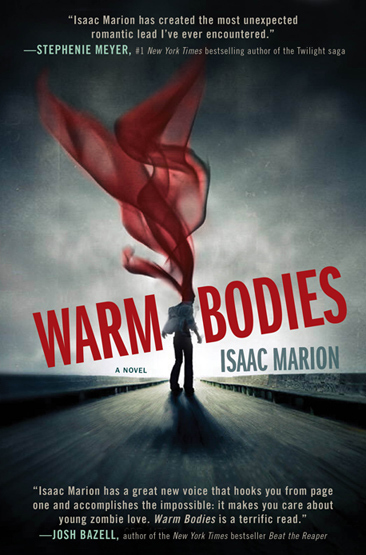 I had heard of Summit adapting a novel called Warm Bodies, but Isaac Marion’s name seem to have evaded my attention the time I skimmed through the article. I decided it was definitely a book I wanted to check out. So I did check it out. It seemed to have received some pretty great reviews. But it was truly the summary of the book that caught my interest. The main character is a zombie and goes by the name ‘R.’ He can’t remember his name, but has a feeling like it began with the letter R. R is very articulate, but all that intelligent eloquence and deductive reasoning only happens in his head. He can only express himself like typical zombies do, by grunting and moaning. Also, like typical zombies, he craves human flesh. After attacking a young man, he forms an attachment to the young man’s girlfriend. He decides to save the human girl from the other zombies and take her to his home to protect her. This causes a huge stir in the undead world, the fact that a zombie and human can be together without some sort of bloodshed. From the first page, I was hooked. I was weary about reading a book where the main character was a zombie. How could I connect to a character like that? Luckily, Marion took a different spin on this zombie story, having something very human and alive residing in a dead, rotting corpse. R is very captivating. The way he thinks and explains things had me hanging on to every one of his words. I sort of deducted that he must have been a pretty charming guy when he was alive. I don’t want to give out too many details about the plot because it’s a rather short book. It’s so hard to write a review without spoiling some elements about it! But there are several scenes that are slightly confusing, but kind of cool at the same time. Those scenes enlighten R about the human girl, Julie, and in addition to Julie, make him feel more alive. Julie is a pretty dynamic character; she’s a bit all over the place, but I think that’s what R needs. He needs to see all those kinds of emotions to help revive the ones he once had. I absolutely recommend Warm Bodies to everyone. Whether you love or hate zombies, you’ll enjoy this captivating story. I can’t wait to see how it adapts to film. At the moment, Nicholas Hoult (X-Men: First Class) is attached to play R, and Teresa Palmer (I Am Number Four) is in talks to play Julie. Both are actors that I really like, so this makes me extra excited to see this film whenever it comes out. Until then, I will be on my friends like a zombie to get them to read this book. Warm Bodies is now available in bookstores. Click here to purchase it from our TYF Store! Previous ArticleListen to Episode 8 of our TYF Podcast!